Speaking after the Volga automobile 60-80 people will believe a slight impression of the founding leaders are riding models Bacheng brand, and by the 1990s, with Volkswagen, Nissan, Toyota and other models introduced, the brand was gradually fade out of our field of vision, with a Volga car at the time is definitely a symbol of identity and status, while the Volga automobile industry is a symbol of the former Soviet Union and pride. Today we have and we come into this brand, take a look at the history of the Volga car. Before talking about the history of the Volga car, let’s talk about the history of Gorky automobile plant, when the Volga automobile plant by Gorky automobile models, Gorky automobile plant in accordance with the Chinese pronunciation of its Russian acronym GAZ referred to as “GAZ factory” . The models produced by the plant, also known as GAZ car. Gorky Automobile Factory was established in 1930, 1932, introduced the first GAZ AA-type trucks, hanging in the official license GAZ 21 Volga Volga before the introduction of Gorky automobile plant has been in mass production of various models of GAZ vehicles , and models including trucks, small buses, cars, jeeps, and even armored vehicles, and the first car GAZ Volga GAZ 21 was formerly known as M20 Pobeda (Pobeda is the meaning of victory), from 1946 to 1958 production, then power on board is a 2.1L inline four-cylinder engine, maximum power of 52 hp (39 kW). October 10, 1956, the first a Volga car brand the former Soviet Union successfully Gorky automobile plant assembly, called the V Jai GAZ 21. The first 21 cars off the assembly line at Ford GAZ assistance to complete only three. Once launched on the popular police and taxi drivers of all ages, but also won the Soviet government agencies of all ages. The car was designed by the Lev Yeremeev, the appearance of the main design elements on the vehicle by the impact of the U.S., while the interior part is based on Ford’s change from O-Matic, power, produced in 1956, equipped with 21 volt Jai GAZ of its predecessor GAZ-M20 Pobeda improvement from the 2.1L inline four-cylinder engine, 65 hp maximum power, and to the years 1957 -1958, V Jai GAZ 21 facelift model ZMZ-21A four-cylinder engine of 2.445L , the maximum power of 70 hp, the gearbox from the United States to use Ford’s 3-speed manual transmission. October 1958 GAZ 21 volt Jai had a facelift, new car the most obvious change is the original grille was replaced with 16 banners vertical grille, in addition, its wheels and taillights, also after simple changes. By 1962, the new car has been improved again, the changes include the exterior, interior and technical upgrades, but most noteworthy is designed based on GAZ 21 GAZ 22 and travel version specifically for the KGB agencies (National Security Council, the former Soviet Union, former Soviet intelligence and counterintelligence agencies) custom 5.53-liter V8 GAZ 23 also began production in 1962 (with the regular edition models there is no difference in appearance, but the appearance of color provide only black). By 1960, although the GAZ 21 is still quite popular, but the design has gradually become out of date. Thus Gorky automobile plant also started the next generation of product development. In 1967, the new Volga GAZ 24 (GAZ-24) began limited production, first produced a total of 24, and by 1970, after large-scale production. GAZ 24’s development can be basically divided into three generations, the first generation model was produced in 1970-1977; the second generation of models produced in 1977-1985; third-generation model in 1982 – 1992 production. The first-generation models replaced the main leaf spring, new ignition, remove the hood on the rear-view mirror, etc. ; and second-generation model is switched to a new bumper, retractable seat belts, front fog lamps and a new dashboard, front seats also have adjustable seats into a separate form. The most worth mentioning is the third generation of the GAZ 24, compared to the previous two generations of models that change to be more obvious, the first power by the previous ZMZ-24 engine (85 horsepower) escalated into ZMZ-402 engine, engine displacement is consistent with the old 2.445L, but the new engine’s carburetor and the introduction of a new cooling system, making the new engine’s power to achieve a 98 horsepower, also in appearance, with a new grille, not the front door of the triangular window, larger wheels and new door handles, and the interior dashboard and seat head restraints, also a new design. Of course there are many derivative version of the GAZ 24 models, including built specifically for GAZ 24-01 taxi, travel version of the GAZ 24-12, GAZ 24 convertible car, truck, 4WD version of the jeep and specialized built for the KGB’s GAZ 24-24 5.53L V8 models, etc., which built specifically for the KGB GAZ 24-24 models, it uses a lot of time advanced equipment, including a 3-speed automatic transmission , power steering, improved chassis and suspension, etc. At the same time in 1982 GAZ GAZ 24 3102 as the third generation of an upgraded version of a small car production in Russia. Its appearance is given a new front face, while the internal switched to a new instrument panel and three steering wheel. Dynamic, equipped with a ZMZ-4022 inline four-cylinder engine, maximum power of 105 hp (78 kW), this model was produced until 2010, including a mid-1997 after upgrade, changes include a new 5-speed manual gearbox, the installation of power steering system, four-wheel disc brakes, 15-inch wheels and so on, power is also upgraded from the previous 105 horsepower to 130 horsepower, of course, specially built for the police and the KGB’s GAZ 3012 5.53L V8 models also have the production, this model was produced until 1996. GAZ 24 production has been stopped in 1992, in the export market has achieved considerable success, it is the Gorky automobile plant sale on the history of a vehicle up to a total of 600,000 units. Most common in the Volga is GAZ 24 model. Even after the reform and opening up, we are able to see this classic face. Official car at the time the field of high-end, in addition to a large red flag, outside the old Shanghai, the most widely used GAZ 24 car, only the bureau-level cadres in order to enjoy the treatment. And into the late 1980s, its status gradually Santana, crown, Gongjue Wang, etc. replaced. By 1992, with the Soviet Union, Russia’s auto industry has become bleak, in the 1990s, the Volga has also launched several models, but not their long life cycle, including the launch of the GAZ 1992 31029,1994 launched in 3110 and launched in 1996 GAZ 3110, and by 2000 the annual production of only the Volga 56000. GAZ 24 in 1992, discontinued after the GAZ 31 029 officially listed, which draws on models designed GAZ 24 and GAZ 3102 two models, this model be integrated products, and this model on the body design more aerodynamic design, while the tail remained a GAZ 24 design, dynamic, GAZ GAZ 3102 consistent with 31029, but the V8 is no longer launch 5.53L car. GAZ 31029 officially discontinued in 1997. GAZ 3110 (GAZ-3110) is the GAZ 24 modernized version of another, put into operation in 1997, a new car in appearance on a new design, more modern feel, but also in body paint instead of propylene acid paint, had substantially reduced the Volga car body rust problems. Also worth mentioning are the GAZ 3110 also introduced in the power ZMZ-560 and ZMZ-561 two 2.1L turbocharged diesel engine, which ZMZ-560 engine’s maximum power is 70 kW (95 hp), ZMZ -561 engine maximum power of 80 kW (109 hp). The car stopped production in 2003. The 3110 station wagon version of the GAZ 310221-2005 was discontinued. Sedan version in 2003, before the cut-off headlights also had a style change, but still maintained a station wagon version of the 1997 style headlights. In addition to the GAZ 24 based on the derived models, Gorky automobile plant also introduced 90 other two new models, including the 1994 to 1997 production of GAZ 3105 trial, which uses a four-wheel drive , OHC V8 engine, but only after the production of hundreds of department discontinued. After 3105, the replacement of its rear-wheel drive products in 1998 GAZ 3111 to 2003 for the production. Russia to enter the car outside the Western consumer market. As production costs are too high, its starting to make $ 8,800 no competitive advantage, and soon after quit the production. To the joint venture vehicle in order to face the 21st century and gradually occupied the situation in the Russian luxury car market, GAZ car is still a final effort, the introduction of a more active modern Volga cars, GAZ 31105 2004 GAZ 3110 as an alternative to car type of introduction, not only transmission and suspension upgrades, and in 2006 the old ZMZ-4021 and 4062.10 Chrysler engine was also replaced by the 2.4L DOHC engine, its maximum power of 123 horsepower. The end of 2005 Russia’s Gorky automobile plant main owner Deripaska (Russia’s largest aluminum giant) announced Gorky automobile plant will be phased out production of “Volga” brand cars, by 2007 all over. The majority of the Russian “Volga” brand car owner’s request, the cut-off, the Gorky automobile plant will continue to produce the car parts for a period of 10 to 15 years. In fact, back in 2000, Deripaska acquired Gorky automobile plant, the plant’s small car line began regular holiday. At that time, the market has been unable to digest the “Volga” car brand of all production capability. But by 2006 GAZ depot overturned the previous decision, announced further investment in production of Volga cars, and continue to produce at the production launch in 1982, GAZ 3102,1997 GAZ 310,221 and was launched in 2004, launched GAZ 31105 , and Chrysler also reached an agreement, the introduction of the Dodge Stratus and Braun’s production equipment and intellectual property rights, domestic production in Russia, and on this basis to allow for new car development. In 2008, Gorky invest $ 200 million the company prepares to launch new car Volga Siber, plans to produce 100,000 vehicles, the largest production capacity can reach 16 million vehicles, the company would have 5-6 years to prepare, each year 45,000, but a financial crisis hit completely disrupted Golgi depot plan. September 2008 Siber listed in the design of new cars, and Chrysler Sebring quite similar, because the car’s technical support is from Chrysler. Power has also adopted the Chrysler 2.0L and 2.4L engine, power was 141 hp and 143 hp, 188 Nm of torque, and 210nm Nm, matching the engine and 5 speed manual 4-speed automatic transmission. After the September-November launch of the new car dealer sent a total of 1,000 vehicles, of which 35% by the state institutions, banks, customs orders, sales are very bleak, almost became a victim of the financial crisis, and to the Volga Siber launched in December a substantial discount from the original $ 20,000, benefits to 1.6 million dollars, which brought a certain amount of increase in sales. 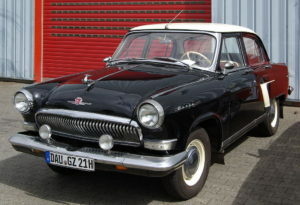 In the old Volga, the Volga in the sale of three cars in the first 11 months of 08 produced a 19 956-type cars, but car sales accounted for most of the year the share of the Volga. To the first quarter of 2010, sales of Volga Siber cars only 200 or so, but because of lack of complementary products some time ago, Volga Siber production line had to stop. In addition, the first half of 2010, total production of Volga cars brand also only 2500 or so. At the same time in 2008, Renault had to buy $ 1 billion 25% stake in the Volga, to 2011, the Renault-Nissan Alliance to discuss again with the Gorky automobile plant, Renault wish to acquire 10% stake in the Volga car, The Nissan will soon decide whether to buy the same price Volga 25% of the shares. In addition, in July 2011 Gorky automobile company also said that starting in 2012 Gorky automobile plant will start assembling the major brands of car production joint venture, when the Volga brand of cars will stop, but that does not mean that domestic “Volga” brand to disappear.